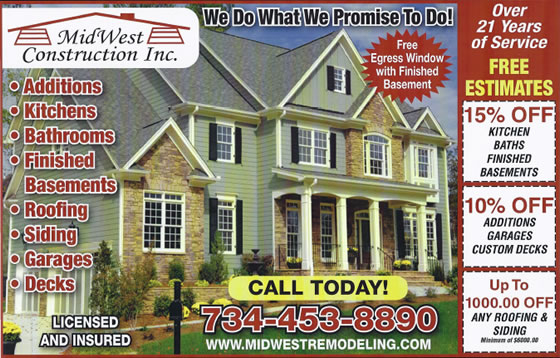 Throughout the year, Midwest Construction offers special discounts to our remodeling of Kitchens & Baths, Roofing, Additions and other home remodeling projects. You can take advantage of signficant savings on your project by referencing the below promotions. Check back routinely to find the special you have been looking for. We pride ourselves on a job well done. Here is what one of our recent customers had to say; "It turned out better than I imagined it would. They did a great job and I am so glad I called them.". Looking to put on an addition? Add a deck? or Perhaps redo your kitchen. Midwest is here to help. Tell us the details of your project and we will give you an estimate. Nulla Molestie tortor non felis commodo, non laoreet lectus imperdiet. phasellus augue felis, aliquet quis lectus eu, hendrerit commodo lectus. Aliquam vitae est non eros vehicula sodales. © Copyright 2016 - MidWest Construction LLC.